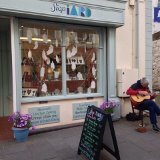 ‘Siop Iard’ Caernarfon was opened in 2013 by Angela Evans, Ann Catrin Evans and Dave Stephen and in July 2015 they expanded to open a second shop in Pwllheli. I was privileged to be asked to join their new adventure alongside two other makers; Elin Mair ‘Janglerins’ and Lora Wyn. We share the responsibility of running the Pwllheli shop, displaying work from all six of us and sharing the workshop area at the rear of the shop. 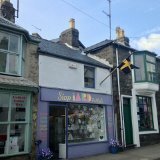 Siop Iard Pwllheli is located in the popular seaside town on the Llyn Peninsula and the Caernarfon branch is nestled within the historic town walls. Both towns offer the rich reward of locally made products, and an enticing variety of unique independent shops. The Pwllheli branch oozes a fresh chicness from its white washed walls dotted with wall cabinets, each displaying tempting treasures. The long, low shop area creates a sophisticated, intimate atmosphere for comfortable browsing, whilst the little workshop at the back is a compact reminder that each piece on sale is entirely handmade by the artists. The Caernarfon branch opts for a rustic swagger, with a compact attractive shop and a larger workshop area stacked with intriguing tools. Here you can take a peak into the making process with hammers, flaming torches, saws and other signs of curious industry.